When I adopted Gretel, she was almost 1 years old and the rescue told me that she was crate trained. After bringing her home we realized she was most definitely not! She threw an anxious fit when I shut her in a crate. One time, she broke a nail scratching the sides and bled all over. Another time, she actually busted the plastic crate in half. I had to, basically, start training all over for her. So how do you successfully crate train a new puppy or an adult dog? 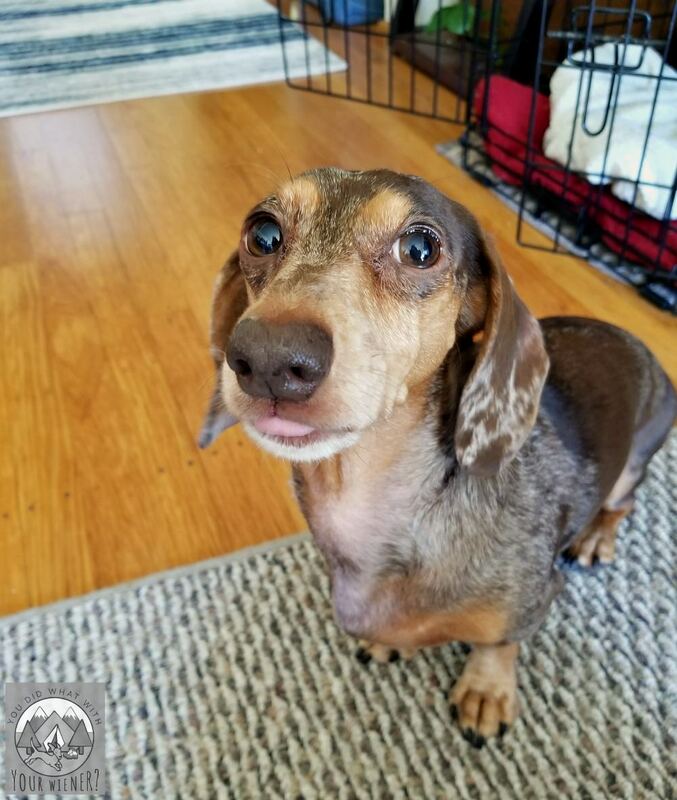 Here are some helpful tips to crate train your dog, including the notoriously stubborn Dachshund. There are a variety of crate types on the market that are made from a range of materials. Each has their own value, depending on the circumstance. Common dog crate materials include: soft sided, plastic and metal. The reason for using a crate will likely dictate the type of dog crate you select. For example, soft sided crates made from fabric are ideal for air travel whereas metal or a hard plastic is more suited for potty training, or establishing a safe “den” for a dog to retreat to while in the home. 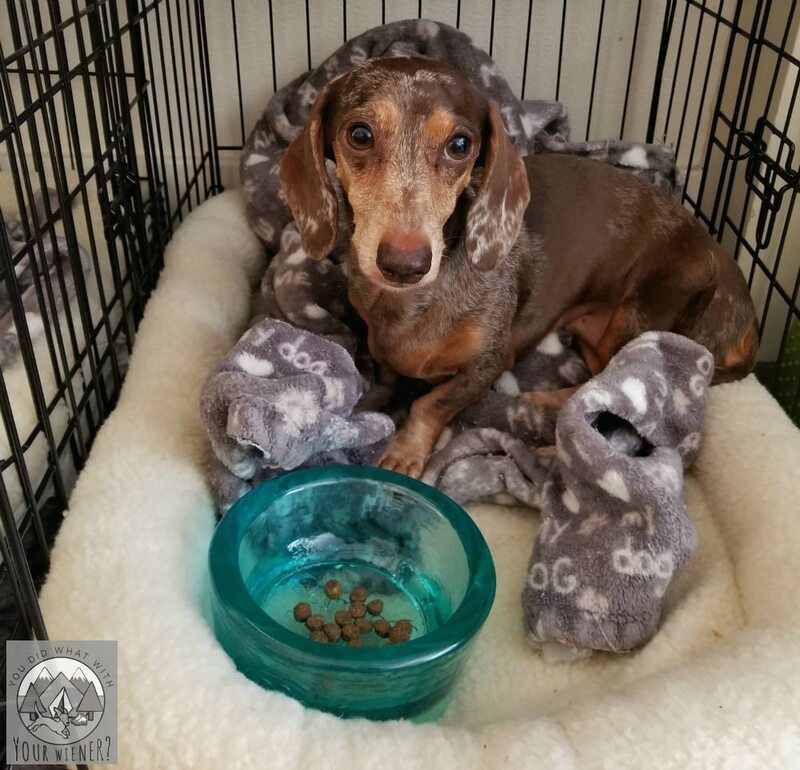 I chose a metal – sometimes called open-wire – small dog crate from Carson Pet Products for Gretel because, after trying the small plastic ones, I realized that she needed to be able to see out to feel comfortable. The general crate size rule is that it should be just large enough for your dog to stand and turn around comfortably. While a crate is not solely used for potty training, the theory is, if a crate is too large and allows for extra space, there’s a higher chance a dog will relieve him/herself. Choosing a crate that is just big enough to be comfortable almost always eliminates this issue. Gretel was more relaxed in a larger crate so I “broke the rules” and went with a crate that was 2-3 times larger than the recommended size. I solved the crate-potty issue by filling the entire thing with her dog bed so there was no where to pee except in her “den”, which dogs don’t like to do. If you have a dog that is still growing, there are crates with dividers that you can purchase which allow you to adjust the amount of room they have as they continue to grow. Which Dog Crate Do I Recommend? 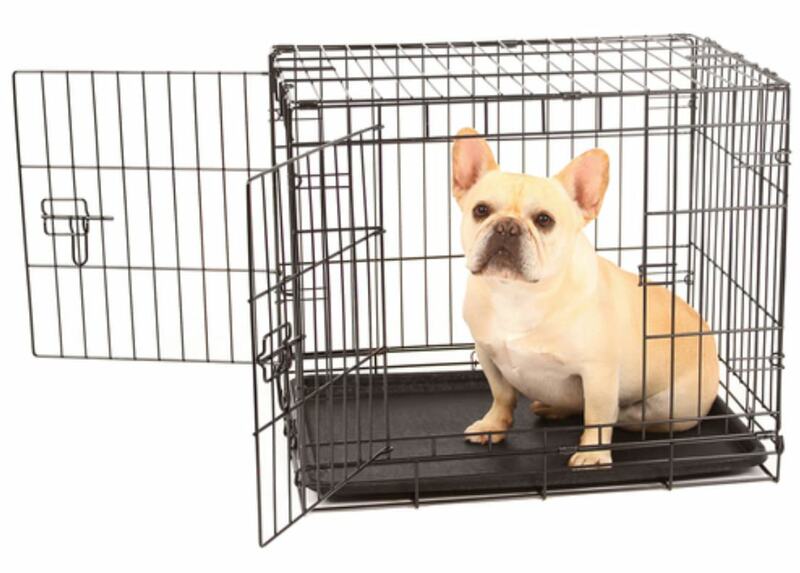 We use the small double door wire dog crate from Carlson Pet Products. It’s versatile – I can leave it uncovered so Gretel can see out or I can cover it up if she needs her own private den when we are out and about (she tolerates that now – she didn’t at first). It has two doors – one on the side and one on the end – so I have a lot of options for placing it around the house. I can easily store it when I’m not using it. It’s quick and easy to set up. The bottom pan is removable and easy to clean in case there are any messes. Carlson would have let me return the crate within 30-days, with proof of purchase of course, if I hadn’t liked it or it hadn’t worked for Gretel (important: this applies only if the crate is purchased directly from Carlson Pet Products). It folds flat, and latches closed, so I can easily take it with me if we are traveling where a crate is needed (like a hotel, dog fitness/agility classes, and camping when she was on strict crate rest for IVDD). Crate training should be a positive training experience, using positive reinforcement such as praise and high value treats. Don’t ever force your dog into a crate or use it as a punishment for their behavior. In order for crate training to be effective, the crate needs to be viewed as a happy and safe space for your dog to be spending time. No big hoopla needed. Simply place the crate in an area of your home where the family spends a lot of time together, such as your living room. You can make the crate comfy with a towel or blanket. I personally recommend placing an article of clothing you’ve worn, like a night shirt, in the crate so your smell is a part of the new comfy den. It can be soothing for dogs to associate the crate with your smell. 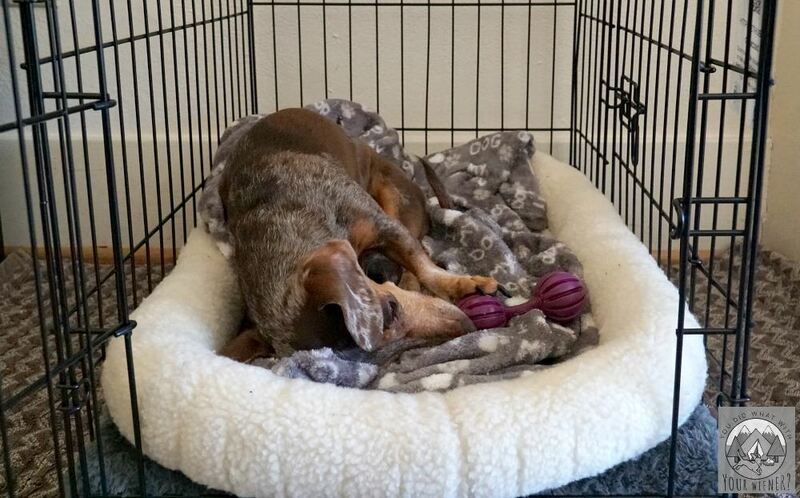 Some dogs may naturally hop in a crate and start to take a snooze, others may not. If your dog doesn’t go in the crate on their own, bring the dog over to near where the crate is located by calling them over in a happy way, and giving them a treat when they are close to you or sitting near the crate and rewarding them when they come over to pay you a visit. Place some high value treats near the crate entrance, and reward the dog as soon as it gets close to the door and takes the treats. Next, place some treats into the crate and praise them as soon as they enter the crate (even partially) to retrieve the treat. Next, place some treats (or a toy, if your dog is not treat motivated) towards the back of the crate so they need their whole body to enter in order to retrieve the treat or toy. Praise your dog and give some additional treats each time they enter the crate. Repeat this step a few times over the span of a couple days. Having your dog associate a crate with its meals can help with crate training. Start by feeding regular meals near the crate. If your dog is not going into the crate voluntarily at this point, place the dog’s bowl of food in the crate, as far in as your dog will feel comfortable going without exhibiting stress. Each meal, try to have the bowl of food be pushed back a little further until their body is fully in the crate and they are calm. If you have not yet closed the door to the crate, once your dog is entering for their meals, begin by closing the crate door and immediately opening it while they are still eating. After you’re able to open and close the door a few times without them noticing, you can try keeping the door closed until your dog has finished its meal before opening the door. If they are comfortable with that, you can begin to extend the length of time before the door is opened in increments of 5 to 10 minutes, which will allow your dog to get used to being in the crate. If they whine, don’t open the door until they stop whining, otherwise they’ll associate that behavior with a reward (the crate opening) and it will reinforce this behavior. Once your dog is comfortably eating their meals in a crate without showing signs of anxiety, you can now have them crated for longer periods. Start by calling your dog over to the crate and giving a treat. Next, give the verbal cue to enter the crate (for some people its the word “kennel,” for others it’s “bed” or “bedtime”). You can encourage them to enter by pointing to the inside of the crate while you have a treat in your hand. Once your dog enters the crate, give them the treat and close the door. Hang out next to the crate for a little while (starting with a ten minute span), then make your way to another room for a bit, and then return to sit near the crate. If your dog is quiet and calm, open the door, and praise it. If your dog is whining, wait until they are no longer making noise to open the crate (see above). Continue to repeat this process and increase the length of time you leave your dog in the crate and the amount of time you’re out of the room. Once your dog can stay comfortably and calmly in a crate for 30 minutes, you can leave the house and try leaving your dog crated for short periods with no one home. Alternate crating times when you’re home and when you’re away so your dog doesn’t associate the crate with you not being home. Each time you open the crate, praise calmly. You don’t want your arrival home to be filled with activity that can cause anxiety. 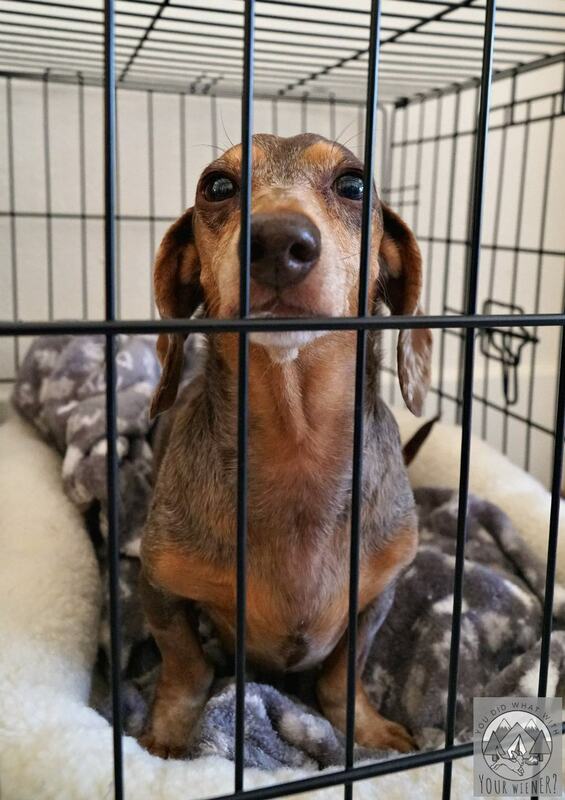 Personally, I try not to let Gretel out of the crate immediately after I come through the door. I often come in the house with no fanfare and do a couple of things, like put my groceries in the kitchen or keys on the table, before walking over to her crate and calmly letting her out. She has learned to stay calm in the crate even as I arrive home, although she does always watch me eagerly. Our happy, excited time happens after I let her out of the crate. She jumps around and give her lots of kisses. I do this because I always want her to associate the crate with being calm and teach her patience that me opening the door does not mean “go crazy time” or that I let her out immediately. How Long Can a Dog be Crated? 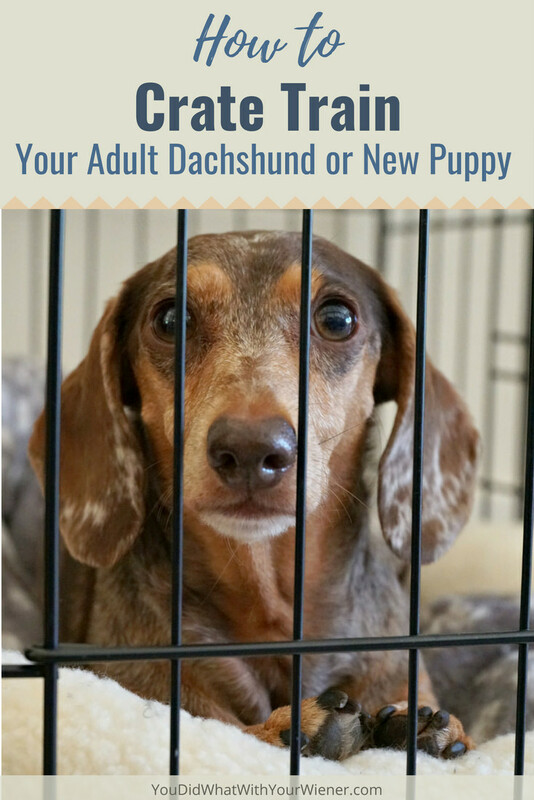 The answer is different if you’re crating a puppy or an adult. A puppy can normally “hold it,” for a shorter window of time because their bladder is smaller. The general rule of thumb is a puppy can hold their bladder one hour longer than the number of months old they are. So if they are two months old, they can wait to go potty for three hours. That said, you should always take a puppy outside every time it wakes up and shortly after it eats. When your dog is an adult, it can be crated for longer periods of time, but generally no longer than eight hours. Eight hours is a long time for a dog to be kept in a crate. But this is where I get real honest. When Chester was a puppy, I worked long hours and spent a lot of time out with friends. I admit I left him in a crate for up to 10 hours once or twice. I also admit that there were a few times that I came home, let him out to eat and potty, and then put him back in the crate to go out. That sounds cruel looking back on it but he was my first dog and I didn’t know any better. I definitely DO NOT recommend doing that and would never do it again unless it was an emergency. I get that life is busy though and, as much as you love your dog, there may be times that you need to leave them alone in a crate for more than 8 hours. If your work schedule is such that you can’t run home on your lunch break to let your dog out, you might want to consider hiring a dog walker to check on your dog, and let them out, midway through the day. Alternately, you could take them to doggy daycare on days that you know you will be gone for a really long period. If your dog is anxious, a crate will simply help your pet from being destructive, but it won’t mitigate separation anxiety. First, if you have used positive training and were gradual with your introduction of the crate, you are less likely to have your dog associate anxiety with being in a crate. Second, there are calming aids that can help address feelings of unrest your dog may encounter due to separation anxiety. Note: the links below are affiliate links so I get a small commission, at no additional cost to you, if you make a purchase. Examples of such tools include: dog anxiety vests (calming shirts) that provide a “hug” of fabric, pheromone diffusers, CBD oil and treats(like what we use from HempMyPet, and treat dispensing toys. With positive training, and possibly the help of calming aids, your dog can learn to see the crate at home as their happy place. They will likely find it comforting to climb their cave when they are feeling uneasy or when wanting to take a nap. Disclosure: I reference a couple of products in this article – Carlson Pet Products and HempMyPet – that have previously compensated me for sharing information about them with you. I continue to like and use them so I mention them from time-to-time when it’s relevant. Great article, great training tips! Hi Simona. Many people misunderstand the purpose of crate training. Or rather, may have come across information about it that is different than my reason for insisting it should be done. In my opinion, it has little to do with potty training or training a dog not to chew on things, although it can help with both of those. Crate training to me just means they are comfortable in a small, confined space. There are many reasons why you would want your dog to be comfortable with this: If one travels on an airplane with a dog on an airplane, they will need to be in a dog crate or small carrier; If there is a natural disaster emergency and your pet needs to be rescued, they will held in a crate until you can come get them. Why not make sure they won’t be upset by this? ; When your dog is waiting for a procedure at a veterinarian, they will be held in a crate. I could go on and on. Instead of suggesting to me that I explore more options, I suggest you consider future circumstances where your dog could be very upset, or injured because they panic, if they are put in a dog crate. I’m not saying that to be snarky, I just stand by my recommendations that all dogs should be “crate trained” to at least be comfortable in a dog crate.